MEMPHIS, Tenn. --Imagine living in an apartment with a rat infestation the landlord won't address, or owning a home next to a property where the grass is as tall as you. You reach out to 311 for assistance, but that doesn't seem to help either. A News Channel 3 investigation reveals residents are calling in complaints to Code Enforcement, that aren't always quickly, getting resolved. Data shows complaints and violations are on the rise, and so too is the time it's taking to fix the problems. Wanieka Brown says the abandoned property behind her South Memphis home has become a literal dump. "Randomly people just come and throw their tires, mulch, carpet," said Brown. An alley separates Brown's back yard from what was an apartment complex. When WREG visited, it was covered in weeds as high as 10 feet tall. Brown's shed was recently vandalized, so she also worries the overgrown grass provides cover for criminals. "My safety, my children`s safety...I'm concerned about that." Brown says she complained to Code Enforcement over a year ago, but was told problems would be addressed after a court ordered demolition. She continued, "That`s why I `m contacting you all on today, because I just feel like the results hadn`t been resolved. They overlooking us." For several months, News Channel 3 has been investigating unresolved code enforcement complaints. The City of Memphis now tracks data such as open service requests and posts it online. One of its stated goals is to reduce the number of active code violations. Its data website shows, as of September, there were close to 10,000 open, service requests. WREG filed a Public Records Request in July for the 'raw data' for what was then roughly 6,000 outstanding requests at residential properties. The city sent WREG data for 4,776 service requests dating back to January 2018. It reveals 311 requests for things like high weeds, dilapidated homes and abandoned cars. The data also revealed numerous violations at rental properties where landlords weren't making repairs. High numbers of complaints forced Code Enforcement sweeps at places like the Eastwood Park Apartments and the Villages at Harrison Creek. At Harrison Creek an inspector said "The entire complex is filthy with trash all over." Additional entries showed some units were without air and smoke detectors. Another read, "Exterminate rodents, bedroom mold under carpet...ceiling leaking, no cold water in kitchen, cabinet in bathroom and kitchen rotten and damaged." New owners have started repairs at the Pendleton Place Apartments. That's good news considering residents reported things like leaking and falling ceilings, non-working air conditioners, and holes and rats in their units. One tenant's complaint noted, "feces over the apartment from stopped up toilet upstairs!" The problems at Silk James' Raleigh home start at the front door, which doesn't always open. "Sometimes it opens sometimes it doesn`t". James told News Channel 3, "We stopped accessing the front door period, and we would just go through the garage or have our company come in through the garage, but now the garage door is about to fall down." Stepping outside the back door, to the deck, is a problem too. The wood is so badly rotted, there's a hole big enough to fall through! WREG found James' complaint in the thousands we reviewed, and it's one of the oldest. She rents from FirstKey Homes, which is connected to CSMA BLT, a repeat offender in the complaints NewsChannel 3 examined, and a company on the city's Top 10 Code Violators List. After not getting results from her landlord, James filed a complaint with Code Enforcement in February. "He came in, I walked him through what was going on , he didn`t write anything down," said James of the inspector. Seven months later, James says she hadn't gotten much of a response from the city either. "I thought they were going come out and actually assess the situation in a serious manner and at least you know help me to do something about it, contact the landlord, let them know this is wrong, this is serious, something has to take place, but none of that ever happened." We shared our findings with Memphis City Council Chair Berlin Boyd. The district he represents had the most open service requests. "It`s something that`s startling, because it’s over 1207 open complaints in District 7 which bothers me," said Boyd. Boyd's district also includes the zip code with the most open complaints, 38107, an area with neighborhoods like North Memphis, New Chicago and parts of Uptown. Boyd said, "The one thing that`s important to me is making sure that our constituents as well constituents throughout the entire city they are getting their complaints heard, and closed and actually receiving some results." Of the outstanding code complaints WREG reviewed, 77 percent were listed as "in progress". Public Works Director Robert Knecht told WREG, "The biggest challenge is managing expectation with regards to how we manage these issues." For example, Knecht said how quickly a request is resolved can depend on whether the property is occupied or not. He says increases in outstanding requests are seasonal and especially common in the summer and winter. He says their goal is to respond to initial requests within five days, and follow up in one to two weeks, except in emergencies which are handled sooner. "Where we have typically seen challenges sometimes is the number of properties being managed by one inspector and sometimes that follow up date slips." To lighten that load, Knecht wants to add more staff. He plans to ask for an increase in next year's budget, enough to create a second shift and, or add weekend crews. "There is a need, and we hear citizens frustration. 'I’m reporting the parking in the yard, well, code enforcement shows up, there’s no parking in the yard, well it’s not happening during the time.' So we recognize that." Knecht also said they've recently created a unit called 'Environmental Enforcement' to aggressively deal with problems like littering and illegal dumping. In addition, Knecht hopes the creation of a rental property registry will help better track landlords, especially those with a history of problems. He also said the city is looking at additional ways to assist low income residents who may not have the funds for upkeep. All changes that could lead to residents like Brown and James getting results much sooner. "It`s just unacceptable for me to have to wait months, these were, are serious issues," said James. Brown told News Channel 3, "It shouldn`t have to take us to call the news to get on the case." After WREG got involved, the city went out and cut the grass next to Brown's home. Knecht said they'd already cut it twice. Records show property owner, Roger Smith of Arkansas, has been assessed twice for high weeds. There's also an assessment of more than $30,000 on the property related to the demolition. Knecht called what happened at the James' home a "miss" and said the inspector is being retrained. 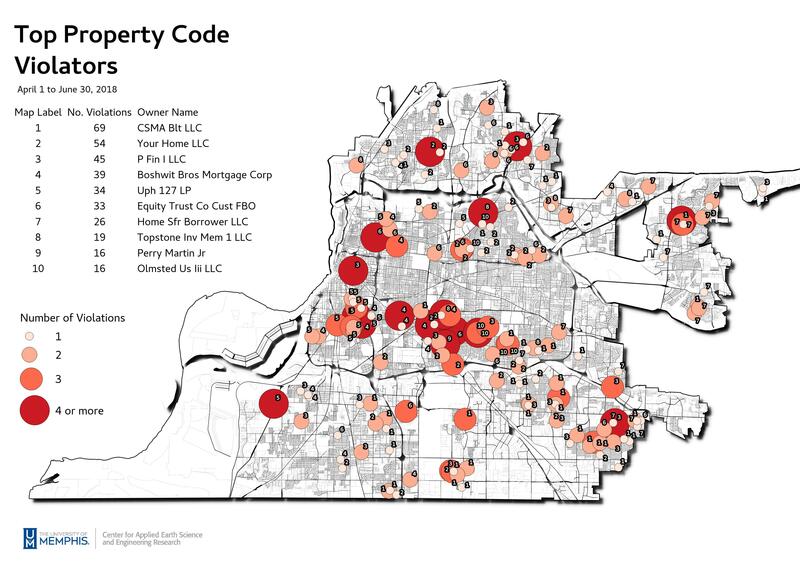 Code Enforcement has been back out to the home and so has FirstKey. To file a service request, click here or call (901) 636-6500. Earlier this spring, the city hired Steve Shular from the county to tackle unresolved issues and citizen complaints. Shular can be reached at steve.shular@memphistn.gov or 636-6740.